The political trifecta behind the push for racehorses on beaches: Independent candidate James Purcell , Labor candidate Kylie Gaston and Minister for Racing Martin Pakula. If Warrnambool City councillor and ALP candidate Kylie Gaston had one job to do this week, it was to make sure she pushed the vote to have racehorse training back on Levy’s Beach by December. 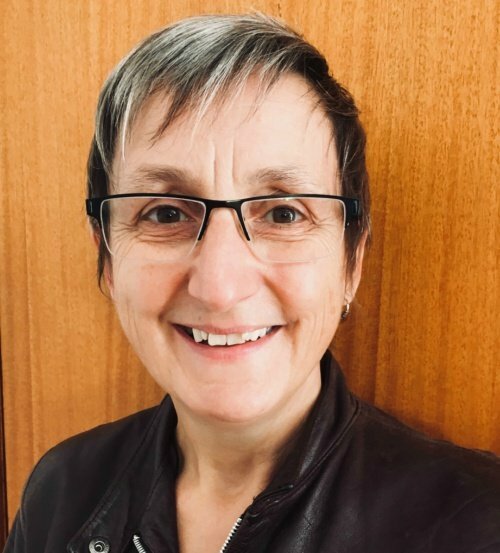 I have seen Cr Gaston move fast, but never quite as fast as on Monday night when – amidst roars of protest from the council gallery and dissent from three council colleagues* – she cracked the whip and moved the motion to allow the council to again issue beach permits to the Warrnambool Racing Club. At that moment, Cr Gaston shifted from being an environmentalist, to an ALP candidate with an agenda. It was a very public shift that shocked many of her long-time supporters, some of whom were in the gallery and who left the meeting visibly upset by the sense of betrayal. Cr Gaston knew that the council was most likely breaking its own laws by allowing dozens of racehorses to be trained on what is a public coastal reserve. Despite this, and rather than wait a day or two to confirm the legal advice, Cr Gaston galloped on as if there was no more vital issue than making sure the WRC has seamless access to our beaches once summer closes off Lady Bay to trainers from December 1. The racing industry was so desperate to get back on the beaches that it even offered the WCC what was probably one step short of a bribe: they would fund most of a $400,000 new carpark at Lady Bay, for its own use, of course, and adding even more bitumen to our beach. Sorry, I forgot to mention it was a “bespoke” carpark. Warrnambool Racing Club CEO Peter Downs, who also sits on the council’s Visitor Advisory Committee, must have been thrilled by Cr Gaston’s form. Even more importantly, State Labor Government and Racing Minister Martin Pakula would have been delighted with the performance of the party’s candidate for the south-west. 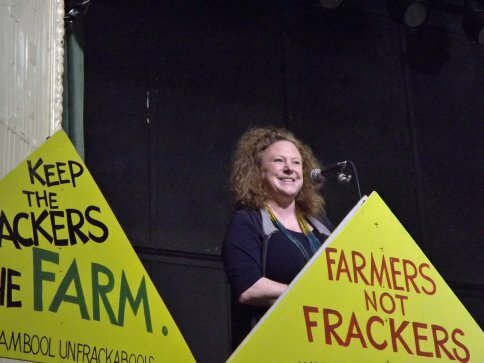 An unfrackable environmentalist: Cr Gaston address an anti-fracking campaign held at Crossley in 2016. Her pro-environment credentials have since slipped. Image: Jinny Fawcett. As we know, Minister Pakula and our own independent Upper House MP and racehorse owner James Purcell have been pushing the whole racehorses-on-beaches issue like there is no tomorrow, such is the might and power of the billion-dollar racing industry. Unfortunately for Minister Pakula, Mr Purcell and the WRC, however, the tomorrows were running out rapidly. In just two weeks time, on October 30, the State Government goes into caretaker mode in preparation for the state election on November 24. During “caretaker mode”, a government is discouraged from making any major decisions. And also in just two weeks time, on October 30, Cr Gaston – and Cr Michael Neoh – take leave from the council to focus entirely on their election campaigns. Monday night’s urgent meeting, called at the behest of Minster Pakula, was a last chance for Cr Gaston – and Labor – to tidy up some very untidy business by hurrying the decision on the beach permits. After all, if the legal advice came back to say that the council wasn’t breaking the law, then the racehorses were home and hosed. And if the legal advice came back to say that it was breaking the law, then Minister Pakula still had two weeks to cook up a plan B. Seen to be green: Cr Gaston, far right, with members of the Warrnambool Community Garden who recently won a ‘Pick my Project’ funding. 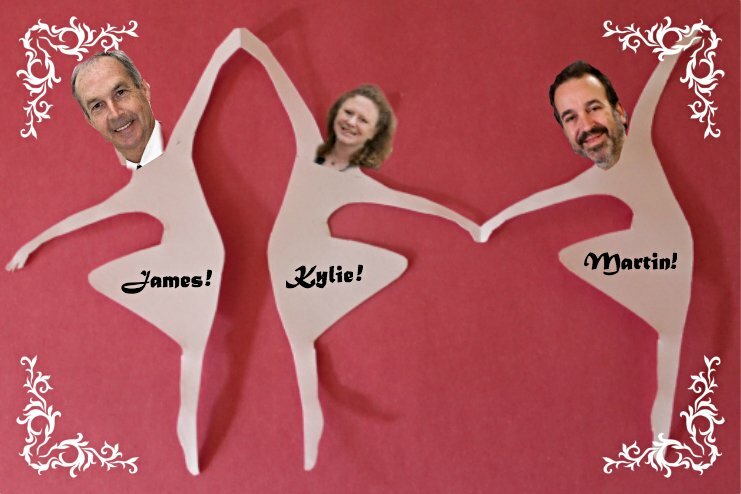 Image: Warrnambool City Council. Of course Cr Gaston has denied her head-of-steam had anything to do with the State Government (“nothing to see here!”) getting in her ear. No, for the once-committed environmentalist who says she loves Levy’s Beach, it was all about “compromise”. You know, give and take: we give the WRC our wild beach, and they take away the wildness, that sort of thing. If it wasn’t so transparent and ugly, it would be darkly humorous. Bu then, in the final act, things became even weirder. 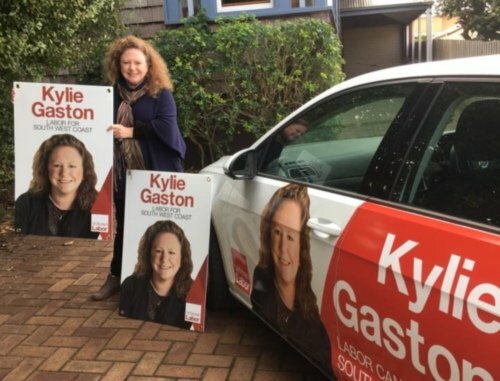 In May, Cr Kylie Gaston became the endorsed Labor candidate for the South-West Coast in the state election, and everything changed. Image: Kylie Gaston for South West Coast Facebook page. Having pushed the vote, without time to properly consider the legalities, Cr Gaston told the local paper yesterday that it would have been better if the vote had not gone ahead. “We didn’t really have time to think about it. It would have been great if that vote did not proceed. “Waiting would have been best, but that was the position we faced at that time”, she said. Back-pedalling often follows a backlash, but if Cr Gaston hoped to regain the respect of those who saw her as a genuine alternative to the old players, well, that horse has already bolted. * Cr Gaston’s motion was passed with the support of Mayor Robert Anderson, Cr Sue Cassidy and Cr Tony Herbert. Crs Cassidy and Herbert are both angling to be the next mayor. Crs Peter Hulin, Michael Neoh and David Owen voted against it. If you would like to keep seeing more pieces like this about local issues, please make a small contribution below. Fantastic piece Carol. You are fearless and tenacious: ideal attributes for a terrier who is a damn good writer.